We’d love your help. Let us know what’s wrong with this preview of Zero Debt by Neeraj Deginal. Zero Debts – Break the Debt Cycle and Re-Claim Your Life, is about the author's ten-year long journey from going neck deep into debt to being absolutely debt-free. To ask other readers questions about Zero Debt, please sign up. The same thing happened with our author Sh Neeraj Denigal. He married and incurred a lot of debt. He had three credit cards, 3 housing loans and one car loan. Indian kids don’t understand finance till they marry. Till the time they are in college they are provided money by their parents and they don’t know how to manage it. Even after getting ot of college they do not handle and the parents usually do this for them. So naturally we are not very wise in making decisions regarding money management. 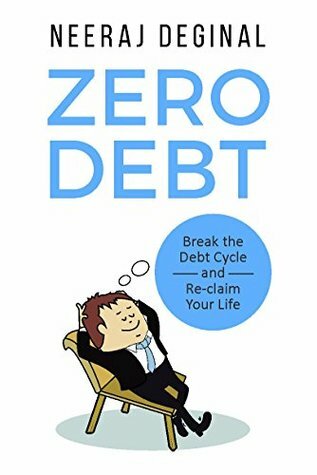 Zero Debt : Break the Debt Cycle and Reclaim Your Life" by Neeraj Deginal is a remarkably well written book! It's a wonderful guide to manage personal finances and lead a stress free life on account of financial outcomes. The author talks about why and how modernization is leading to increasing debt Zero Debt : Break the Debt Cycle and Reclaim Your Life" by Neeraj Deginal is a remarkably well written book! It's a fine book, written in an easy and lucid language, with an appropriate sequencing of his experiences and lessons learned and ways to deal with debt and live a life free from worries about financial expenses. As the author states, this is based on his experiences. The steps he took may not work for everyone, but he wants to inspire people to rethink their situations. I can admire that and get behind that idea. But I think it could have been communicated better. The writing style the author prefers often omits small words such as "the" or "a" or "of," has some odd comma and semicolon placement, and uses the passive voice extensively. It becomes very distracting. In addition, some topics are covered in depth more than once. Redundancy can be effective for short bullet points, but not for pages of material. Zero Debt, Break the debt cycle and reclaim your life is wonderfully simple and simply wonderful book by Neeraj Deginal. This is the real life story of a man who was crushed under endless EMIs. It narrates us how he was neck deep in debts and how he came out of it to become cent percent debt free. I am sure most of us, who bought a home to save tax, bought second home as an investment, purchased a car because it was on EMIs and are left with paltry salary after all the deductions, will be able t Zero Debt, Break the debt cycle and reclaim your life is wonderfully simple and simply wonderful book by Neeraj Deginal. This is the real life story of a man who was crushed under endless EMIs. It narrates us how he was neck deep in debts and how he came out of it to become cent percent debt free. I am sure most of us, who bought a home to save tax, bought second home as an investment, purchased a car because it was on EMIs and are left with paltry salary after all the deductions, will be able to relate to his case. The book states how real estate investment is not always a profitable proposition. The author has incurred losses in all his real estate investments. ‘Buying was always easy; however it is very difficult to sell a real estate property.’ He says. The book highlights how both the schools and families fail to impart any sort of financial education, and how as earning adults we have to pay the price for it. The book is extremely well written. The language is simple, yet riveting. The editing is superb. The book is divided into several short chapters. Apart from finance it also covers health and simplification of life. In the words of the author, ‘the overall objective is to celebrate life, enjoy life’. The book is interspersed with quotes like ‘If you don’t find a way to make money while you sleep, you will end up working until you die – Warren Buffet’ and ‘The three most harmful addictions are heroin, carbohydrates and monthly salary – Nicholas Taleb.’ However I wasn’t able to digest one particular averment in the book. ‘Fixed Deposit attracts 30% tax on the interest earned, irrespective of years deposited.’ This cannot be a blanket statement and the tax on fixed deposits depends upon in which tax bracket you fall. Another startling fact about this book is that it is a copyright free book. Though the book is based on the personal experiences of the author, according to him the ideas are not original. The objective of this book is to offer help and hence the readers are free to copy or reprint any content from it. This review has been hidden because it contains spoilers. To view it, click here. “Zero Debt: Break the Debt Cycle and Reclaim Your Life” by Neeraj Deginal is a book for the finance newbies. The ones who are not blessed to have selected Commerce in 11th grade, but still need to manage their finances properly. Basically, this book is a primer on how to manage the money you earn and not have pending EMIs and credit card statements sitting on your head at the end of every month. The author, Neeraj Deginal, speaks about his own experience of being overdependent on credit. EMI after “Zero Debt: Break the Debt Cycle and Reclaim Your Life” by Neeraj Deginal is a book for the finance newbies. The ones who are not blessed to have selected Commerce in 11th grade, but still need to manage their finances properly. The author, Neeraj Deginal, speaks about his own experience of being overdependent on credit. EMI after EMI, loan after loan, all in search for the “supposed” perfect financial future and social image. After all, eating out every Saturday and being seen with the right people at the right places makes all the difference, right? The author writes about the errors of this way of thinking, and the various steps one can take to reverse this thought pattern. He states that frugality and minimalism is not a bad thing, if it secures you a good financial future. A few problems that I had with the book (as I always do): the structure of the book was a bit off. The author lists down his experience first in its entirety, and then gives his advice and thoughts about it. And in some chapters, the order gets mixed up. I personally felt that each chapter could have begun with the author’s experience pertaining to one topic, what he learnt from it, and how the reader could learn something from his experience. Also, at times the solutions seem too commonplace (though a sentence in the ‘copyright’ section of the book does give a disclaimer to this effect). Hence, the reader could be pressed to search for more diverse solutions to suit his/her own problems. Life of rather I should say urban life especially in Metros and bigger cities is full of chaos now a days. Everyone is runner after name, fame and most importantly money. But little do they realise that where this chase of theirs would land them. Aspiring for a big house, luxurious car and other luxuries of life, we don’t even realise when we are entangled in the clutches of debt. Debt destroys lives, communities, and civilizations. Unmanaged and inefficient debt destroys wealth building. That's Life of rather I should say urban life especially in Metros and bigger cities is full of chaos now a days. Everyone is runner after name, fame and most importantly money. But little do they realise that where this chase of theirs would land them. Aspiring for a big house, luxurious car and other luxuries of life, we don’t even realise when we are entangled in the clutches of debt. Debt destroys lives, communities, and civilizations. Unmanaged and inefficient debt destroys wealth building. That's the truth. If you want to make your money life successful now and in the future, you must get a handle on debt. And this is exactly what the writer Neeraj Deginal has said and shown in the book Zero Debt with his personal experiences and practical solutions. Loans are not bad always. It is almost impossible for middle class people to buy a house without a home loan. What is more important is how you manage your finances and keep a check on the loan amount. No doubt this book is very helpful for managing finances. To have mental peace, spending a debt free life is important. The author has done a good job in describing the situations along with probable solutions. The narration style is very good and everyone who reads the book can very well connect to it. To lead a happy life, it is more important to be free, free from all worries. And this book teaches one aspect of freedom, financial freedom. The book is recommended for everyone looking to lead a debt free life. The inspirational quotes mentioned after every chapter are also wonderful. The author has done a good job in bringing the topic that’s plaguing lot of young people. Societal expectations, lifestyle an relentless advertising leads to making debt cool. Lack of understanding about money and finances especially of how to manage finances is one of the main reasons. This book is a very easy read, written very lucidly using simple language which makes understanding of the concepts easier. Personally as I have read a lot of personal finance books which sometimes feel dry to lea The author has done a good job in bringing the topic that’s plaguing lot of young people. Societal expectations, lifestyle an relentless advertising leads to making debt cool. Lack of understanding about money and finances especially of how to manage finances is one of the main reasons. Personally as I have read a lot of personal finance books which sometimes feel dry to learn the concepts, this work helps in removing that barrier because it’s a personal story of the author which lends it more credibility and relatability. Personally I loved the inclusion of the quotes in the book. This book is a very good resource for beginners in their personal finance journey. The things that could be improved upon would be to have been little bit more specific in the strategies. That could take the work a notch higher. I highly recommend this book as a primer to understand how to become free of debt . Especially useful to people who re starting off in their professional lives. Zero Debt' is an ideal handbook on how to manage finances and also to maintain a fine balance in personal and professional level. The book is broken down into chapters that dwell on author's early years, his financial and health woes, his advice for a better life and finally, the conclusion.The language used is simple and easy to comprehend. The author has meticulously penned down his initial struggles in understanding the financial ball game and also offered practical solutions to various proble Zero Debt' is an ideal handbook on how to manage finances and also to maintain a fine balance in personal and professional level. The book is broken down into chapters that dwell on author's early years, his financial and health woes, his advice for a better life and finally, the conclusion.The language used is simple and easy to comprehend. The author has meticulously penned down his initial struggles in understanding the financial ball game and also offered practical solutions to various problems. He has also enunciated the importance of living life free from stress and debt. I feel that this book is interesting and good to read!!! It is not preachy – Some of us may connect with the experiences of Author!! Must read book to have a stress free, debt free life. Everything you need to do to have a stress free life explained in this book. The modernisation is leading to an increase in debt cycles of an individual. We have seen that in the last decade, and what may the future holds. This is the core foundation of Neeraj Deginal's latest book Zero Debt: Break the Debt Cycle and Reclaim Your Life, a part memoir and other half of the book is full of some pragmatic advice. The book starts by discussing author's life and how he started his career. It leads to cover up the most important decade of his life which includes settling in job The modernisation is leading to an increase in debt cycles of an individual. We have seen that in the last decade, and what may the future holds. This is the core foundation of Neeraj Deginal's latest book Zero Debt: Break the Debt Cycle and Reclaim Your Life, a part memoir and other half of the book is full of some pragmatic advice. The book starts by discussing author's life and how he started his career. It leads to cover up the most important decade of his life which includes settling in job and getting married. Often these two aspects of one's life are enough to analyse anyone's situation rationally since an individual daily activities are bind to them. He then comes to a partial conclusion on how he started a self-movement and came up to a realisation to lead a life without credit cards and finding effective ways to manage personal finances. The second half of the book discusses these effective, pragmatic, experiences from author's own life. His emphasis on mental peace, especially conveyed through a beautiful dialogue between a Harvard graduate and a fisherman, clearly put in me wonders on why realising that financial freedom is a big aspect of overall freedom an individual intends to possess. It is non-fiction work and the narrative voice is smooth, moves in a flow and understandable. The writing style is good. Divided in several short chapters, a reader will be able to grasp the message the writer wants to convey in short period of time. I do feel if some chapters from the first and the second half of the book could have a coexistence or presented simultaneously, this context of the book would be better for a reader to be intrigued by. I will recommend this book to anyone who is interested in learning about ways financial independence can work for an individual with some pragmatic tips that one can easily adapt. Naturally, the book begins with our author in his childhood. I think it true that as children, we are taught ve The most important thing to highlight is that the author is recounting his experience and therefore it is not a guide to follow religiously. It will not necessarily solve your problems. What it will tell you, however, is that very often following a serious kick up the backside, an attitude change is required. With a lot of hard work, you CAN dig yourself out of the bottom of the trench. Today in the world of EMI, credit cards and the desire to posses various luxuries, the possiblity of an individual staying debt free is slim. The author in his book ‘Zero Debt: Break the Debt Cycle and Reclaim Your Life’ shares his personal experience of getting into a heavy debt cycle over the years and eventually breaking free from it. The author starts by highlighting the fact that how families and schools fail to teach kids about managing finances since they are provided for and never have t Today in the world of EMI, credit cards and the desire to posses various luxuries, the possiblity of an individual staying debt free is slim. The author in his book ‘Zero Debt: Break the Debt Cycle and Reclaim Your Life’ shares his personal experience of getting into a heavy debt cycle over the years and eventually breaking free from it.